EuroRVVV 2016 Call for papers: It’s on! Update: The submission deadline has been extended to March 4th due to popular demand! The “call for papers” for the EuroRVVV (EuroVis Workshop on Reproducibility, Verification, and Validation in Visualization) was released yesterday and this year it is focused on medical visualization! The topic is “From Medical Visualization Concepts to Certified Applications”. We hope that everyone gets excited about it and submits as many papers as possible until February 26th, 2016! Update: The slides of all talks are now available here! MICCAI 2015! This year, MICCAI (International Conference on Medical Image Computing and Computer Assisted Intervention) takes place in Munich almost during the Oktoberfest. Sauerkraut, Weißwurst, Beer, and Science. What a great combination! The first day, MICCAI started with a few satellite events. Among these events, for us most relevant: the Tutorial on Advanced Medical Visualization. 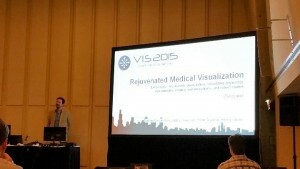 Most of the big shots in the medical visualization area contributed to this event and talked about ongoing research and the current state of the art in medical visualization. Anna Vilanova and Bernhard Preim were the hosts of this tutorial and introduced it.